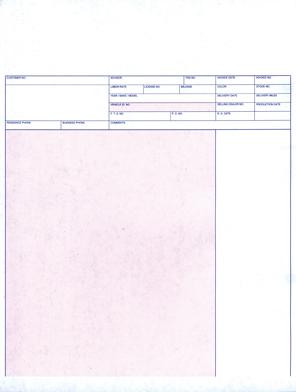 An economical alternative for laser printing service invoices. If your current form looks like this our should align perfectly with your software. Size 8-1/2" x 11". 1-part, 20# White laser paper. Prints in Red and Blue ink. Available imprinted. This is a Service Invoice for the ERA* System. *ERA is a registered trademark of The Reynolds and Reynolds Company. Packaged 250 per pack.